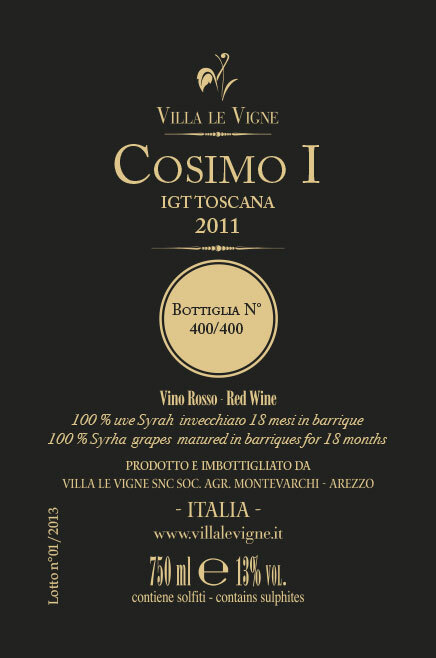 Winemaking: Fermentation in stainless steel with red maceration of 15/20 days. Aging in barrels(2 lap) for 18 months. Ageing: 6 months bottle. Aroma: Melted spices to red fruits jam,blueberries and blackberries. Chocolate, black pepper and cinnamon. Alcohol degrees: 13,5 % Vol. Pairing: Red meats, roasts, seasoned cheeses. 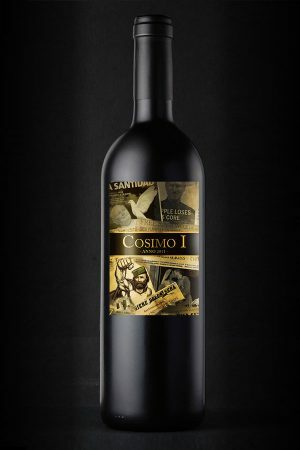 Cosimo I° is obtained with Syrah grapes, selected in the best parts of our hills wineyards. With our ground characteristics and meteorogical Tuscany environment this wine making is an intense red dry and rich. In the glass red fruits aromas prevail. Each bottle is numbered and unique.